The 9.3x64 Brenneke cartridge is one of the most successful rounds and the largest big game round developed by German arms designer Wilhelm Brenneke. Brenneke's prolific inventing and obsession with accuracy and performance led to over 10 new cartridges. He developed the 9.3 x 64 from scratch with no parent cartridge on which to base his design. It was meant to be large and powerful yet function flawlessly in Mauser 98 actions which were standard in the German military in 1927 when the round was first introduced. 9.3x64 Brenneke ammunition is basically a non-belted magnum round. 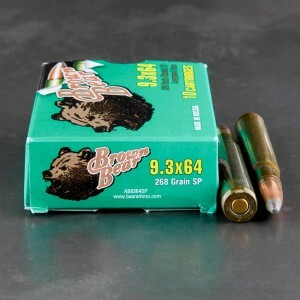 Ammunition for the this Brenneke offering ranges in sizes from 250 grain to 300 grain and launching lead at upwards of 2,400 to 2,800 feet per second. The round is ballistically very similar to both the .375 H&H and the .358 Norma Magnum. 9.3s are fondly spoken of in Africa and are known for their great performance as an open plains caliber able to launch heavier projectiles with good sectional density down range enabling bone-breaking penetration on big critters. The round is a superb western hunting cartridge with plenty of punch for mule deer, elk, and the occasional threatening bear.